Good morning, friends. I’m not sure if our nursery progress has gone forwards or backwards since it was filled with things from my first shower. It is currently full of so many bags containing so many things that we need for our boys, so there’s that, but it is also a much less workable space right now being filled with so many bags that there’s nowhere to sort the things in said bags. But, I suppose having the stuff there technically counts as progress, so I’ll take it. 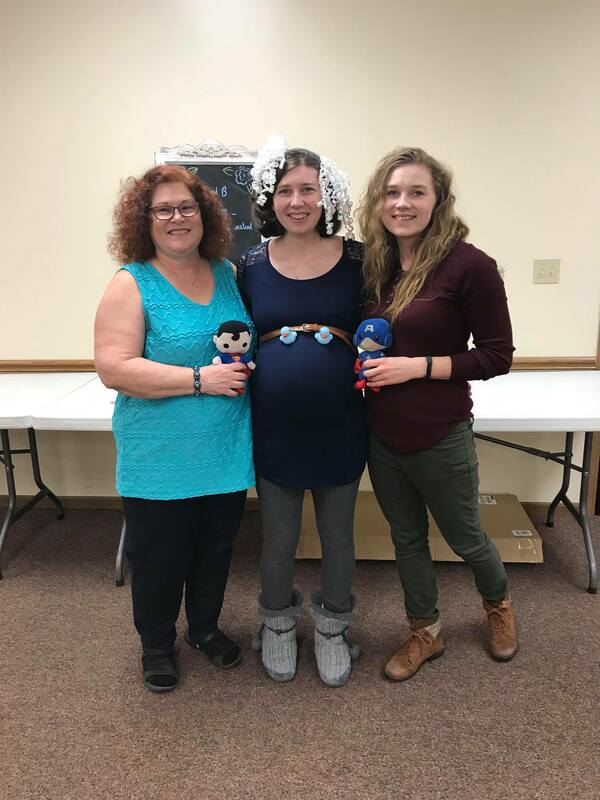 My mom and sister threw me a wonderful, superhero themed baby shower this past weekend. Everything was centered around Superman, my husband’s favorite superhero, and Captain America, my favorite superhero. We’ve assigned one to each of our coming sons Mom and Erin ran with it. Everything turned out really cool, from the decorations to the cakes. It was a really cool shower. My mom is really great when it comes to theme parties, apparently. For my bridal shower she put together a mad tea party from Alice in Wonderland. Everyone was asked to wear a hat and all the food had little signs that said “Eat Me” and the drinks had little tags that said “Drink Me.” There were roses painted red and a Cheshire cat watching over the whole thing and lots of little details that I kept discovering throughout the shower that made me so happy. 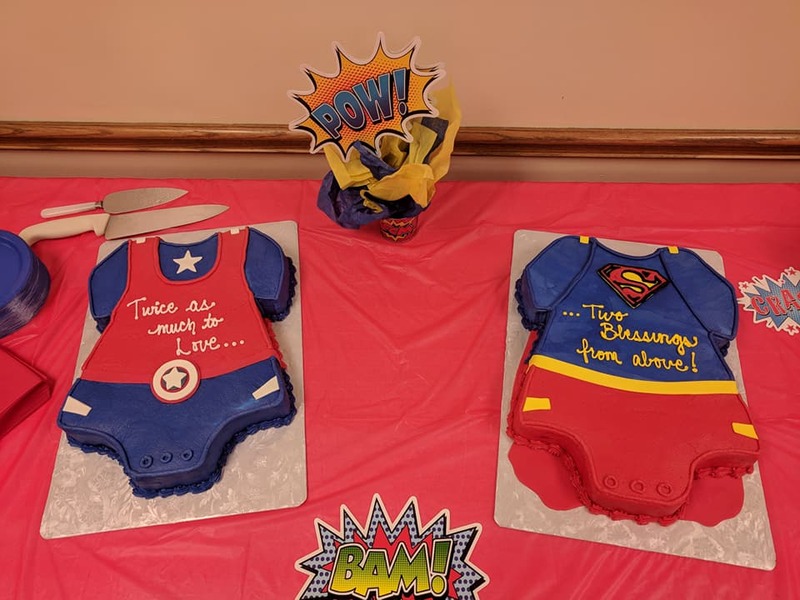 For my baby shower, the details were all superhero themed and they were great. The tables sported little signs with the classic comic book sound effects, the cakes were onesie versions of Superman and Captain America, based off the invitations my sister’s friend designed, and the fruit was displayed as the Captain America shield and the Superman emblem. The cakes were made by the same woman who made our wedding cake, which made me so so happy. Not only is she crazy talented at cake shaping, but the cake itself is my favorite of all cakes. The Captain America was white almond cake, because Captain America is blond, and the Superman cake chocolate (possibly espresso), because Superman has dark hair. Sound logic to me. As strange as it is for me to admit, I might like the white almond cake better than the chocolate. Games were played, naturally. I was measured repeatedly against guesses of how big my belly is. Surprisingly, two people were exactly right with their guesses. They did the cut yard method of guessing and the ends met perfectly around my middle. It was really impressive, actually. 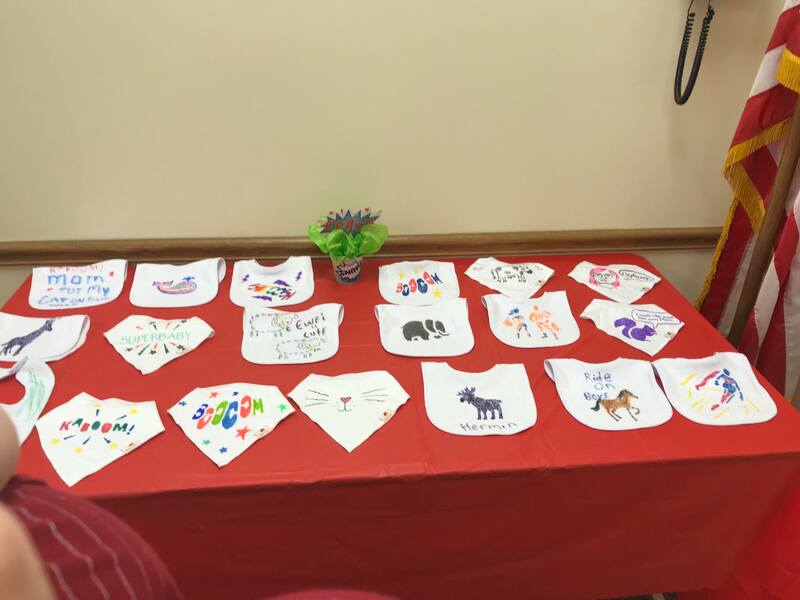 There were bibs to decorate while people chatted and, of course, I had to pick my favorites once everyone was finished. Not super into picking favorites, but I did my best and of course picked the two people who had just snuck out. The hard part about picking favorites is when you recognize the work of certain people and it kind of takes the objectivity out of the equation. I recognized some peoples’ work right away and then it’s a question of, do I want to pick it because I like it, or am I drawn to it because I know who it is? Makes things difficult, but I did my beset to remain objective in my picks. There was a baby animal matching game and a pass the present game, which I had to read off. Those kind of things are fun because they’re interactive, but not like ice-breaker level interactive. The request was made on my behalf that people bring a book instead of a card. This may have been my favorite part. I mean, I did get a lot of nice stuff, but the books were really the most exciting thing. I loved seeing what everyone picked out for the boys. My mom got us Baby Beluga, which is one of my favorites. I don’t even really remember the book that well, but the song has stuck with me my entire life and I’m very fond of it. One of my aunts found a collection of learning books based on classic literature, which I had been registering for individually. I was pretty excited about that, too. We got a great variety, from classics to new favorites. I’m so excited to sort through the bags to find find all the books and organize the little library. My second favorite thing to get, I’ll be honest, was all the homemade blankets. My friend Jess made us a pair with Superman and Captain America fabric that have the bubbly fuzzy baby blanket fabric on the other side. My cousin Sarah made us an owl blanket and a hedgehog blanket, which I love. And, of course, my mom’s friend Marie sent down two quilts for the boys. She made us a wedding quilt with our names and wedding date stitched into the bottom corner. For the boys, she left a blank corner for us to write in their names once they’re born, since we have yet to decide on a spelling for one and really, nothing is set in stone until it’s on official documentation, and sometimes not even then. I was also super thankful to have cousins with small children and work with small children, who went off registry to get me the things I need. There were several things, like a bottle drying rack and a starter first aid kit, that I hadn’t even thought about registering for until recently. I was so focused on the big stuff I lost track of the little things that I still needed. Thankfully my cousins had me covered. My poor husband had to bring all the gifts into the house by himself in all the snow, because of course it decides to snow all over my shower. Hopefully the next one will be less snowy, and also, I’ve promised him help from other people. I can’t help, but I can certain ask people to come help him unload the car. We’ll probably need more than one vehicle anyway. We filled our tiny car and my in-law’s SUV with the presents from the first shower. I’m not sure how many large items are left, so we may be safe from giant boxes, but that doesn’t mean we won’t potentially fill another two cars. I am very much looking forward to my next shower and getting to hang out with my church family and friends. Two more weeks and we’ll have all our gifts and can start buying things to fill in the gaps and really getting organized. We are super excited for organization!